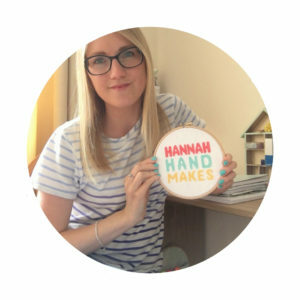 In this post, I’m sharing all the cross stitch tips and tricks (for beginners and beyond) that have been sent in by the Hannah Hand Makes community. If you would like to submit your own tip you can do so here and be sure to sign up to hear if your tip has been featured! If you are looking for a quick read, I have a post sharing my own 15 tips that I have found the most useful or you can scroll to the bottom and pin the photo to save this post and keep referring back to it. It’s always being updated with new tips! And if you haven’t got the time to read this whole post now just scroll to the bottom and pin for later! I travel a lot and can’t always wash my hands as often as I should. I learned a long time ago to put my hoop and later Q-Snaps on backwards. This allows you to hold the back of your fabric rather than the front and when you put it down you are putting it down on the back rather than the front. This helps to keep the front clean because the overdyes (and originally DMC) aren’t colourfast so the piece couldn’t be washed when you finished stitching it. What I mean by backwards is to put the hoop on so that you are stitching inside the hoop rather than on top of it. When I’m going to be flying, particularly overseas, where they don’t allow you to bring scissors I cut my thread into working lengths before I leave home and put it on a thread palette or loop it back on the card for overdyed threads. This way you will have nice straight ends on the thread making it easier to thread the needle. Then I only need to bring a Clover cutter or a needle threader with a cutting blade on it. It also makes it easier to stitch in tight quarters. I usually put my Clover cutter on a pretty ribbon or cording, add some beads and a needle threader and wear it around my neck like a necklace. I’ve never been stopped or questioned about it going through airport security anywhere in the world. 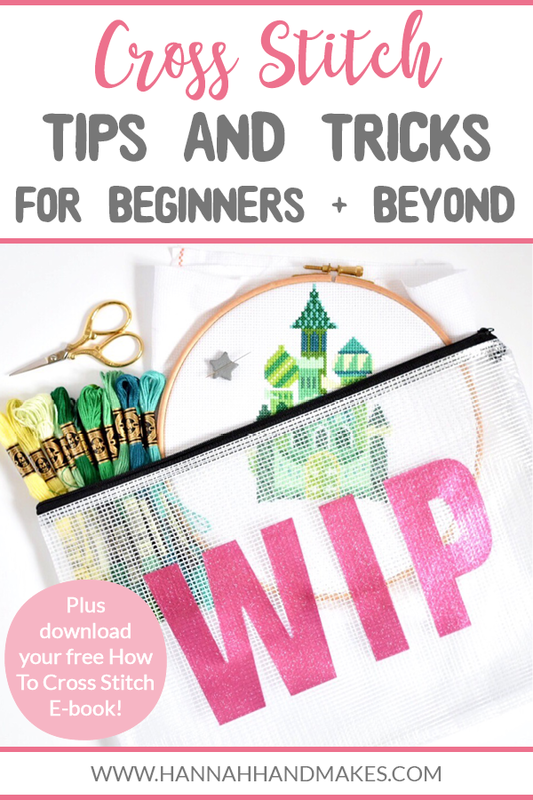 Another tip for travel, particularly long trips (car, plane or train) is to bring a small tote or cloth bag that you can put everything you might need while on the plane (cross stitch, e-reader, book, water bottle, chapstick, snack). The handles of the bag can either be hung on the tray table or the seat belt can be put through them to keep everything together and easily accessible. I also keep a coloured pencil in my stitching bag. Either the ones that twist up and down or a regular coloured pencil with a cap from an old pen to cover the point (less likely to break the point and keeps it from getting on your fabric) and a small sharpener. This way if I’m working on a complicated pattern and keep losing my place I can colour what I’ve stitched and this helps me to easily figure out where I am. I always have a picture of the finished piece (from the pattern) with my stitching. This way when someone wants to see it, you don’t have to take it out of the frame or hoop to show them. Saves time, frustration and shortens the interruption to your precious stitching time. My tip of cross stitching is: when you are stitching and the needle didn’t go into the hole just right, you need to rip it out and try again. You will regret not ripping, especially when you are finished and you are admiring your work. Also, your project may be a gift so other people will be looking at your work so it needs to be neat and correct. Use beads in place of French knots, if you struggle with them. Keep your scissors on a lanyard so they don’t walk away (BEST IDEA EVER). Keep a small piece of Velcro on your thread organiser Run your thread through the Velcro to untangle and it makes it easier to separate the thread. I always start off my work by making a little kit (a heavy duty plastic zip sleeve) so it has everything in it straight away and I don’t have to worry about anything missing later. I put in everything I need from thread, aida, scissors, pattern and a highlighter/pencil to mark off as I go. Then I can just take the kit anywhere with no packing up required! I also do this with all of my projects and I sell project bags for just this reason. The one that changed things for me was using a milliners needle to do French knots rather than a standard needle. Also, have a thin tip fabric erasable pen close at hand to help you count/mark where your rows start/end.